The more I see of Michael Yon’s dispatches, the more I admire those who are out in Iraq doing their jobs as soldiers. This is one of the Queens Lancers. This is the first war that we at home have had a prayer of getting firsthand information on what is happening and who the players are. Every day involves avoiding death and confronting the stark realities of life in the desert. At the same time, we get to see the human dimensions of life in present-day Iraq through the lens of Michael’s camera. This is the third part of Death or Glory, Michaels embed with the Queens Royal Lancers. Read all three parts and draw your own conclusions. 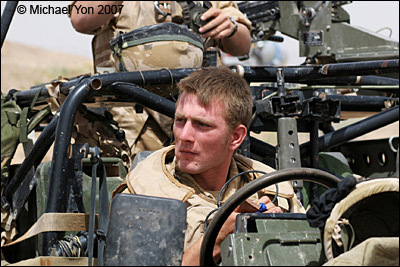 This entry was posted in News blogging and tagged Death or Glory, Iraq war, Michael Yon, Queens Royal Lancers. Bookmark the permalink.